The chicken bus or “camioneta” as locals refer to it, is the main mode of local transportation between towns, villages and cities especially in the western part of Guatemala. Usually, taking the chicken bus is the cheapest option for travelling for any distance. These buses started their lives as yellow school buses from USA or Canada, when these buses reach the age of ten years or 150, 000 miles, they are sold at auction. A lot of these buses are acquired and driven down thru Mexico, Guatemala and other Central American countries, where they are given their second lives. Contrary to their simple and unembellished first lives as yellow buses transporting kids to school, these buses transformed as a gaudy, flashy and decorated chicken buses carrying passengers, loaded with roof racks full of cargos and driving in excessive speed while swerving over mountain passes. The old yellow paint is coated with bright colors and often adorned with murals of religious motifs and mantras. The interior of the chicken buses are modified to accommodate more passengers. Bench seats are altered, wherein there is limited legroom especially for gringo knees that guarantees a bruise or two. They are called “chicken bus” by tourists because they are stuffed with people, that even the bus has reached its maximum seating capacity, bus drivers keep on loading more, plus the cargo on top of the roof of the bus. Not to mention, the chances of having real chickens in the bus is often, locals transport their live-stocks with them in the same bus as well. Adding all these, the ride gives a similar scene to live-stock being transported from one place to another, all cramped up to maximize the space. Camioneta are staffed by a driver and an “ayudante” (helper). The ayudante is responsible for ticketing the passengers, arranging the cargos, calling more passengers along the way, and announcing approaching destinations. With the high-speed of the chicken bus, and driving techniques of the driver, overtaking around a blind corner on a narrow road on the top of a hill, it does feels like you’re having the ride of your lifetime. This is why many locals named it as “cementerio en movimiento” (moving cemetery), because of the high risk of meeting an accident along the way. Aside from the adrenaline rush that the chicken buses can give to its passengers, the mood inside the bus is pretty relaxed actually. Loud music is played along the way, either a marathon of love songs or of reggeaton beat. You will see strangers exchanging story, people taking a nap and street vendors hopping in to sell their products to the passengers. Indeed, the chicken bus is one interesting ride. It reflects colorful and fascinating culture of Guatemala. 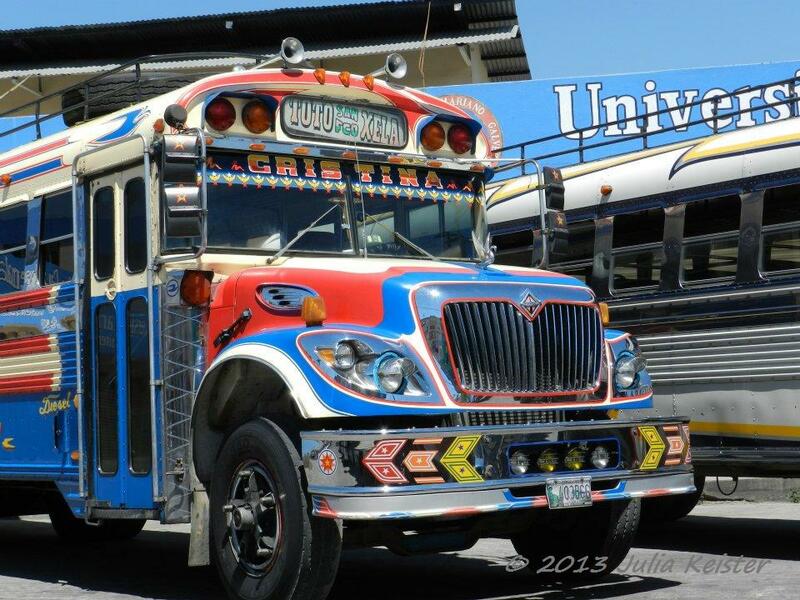 So, if you’re a thrill seeker and would like to experience a different type of ride, take the Chicken Bus of Guatemala. If you enjoyed these bits of information, and wants to read more from The Mixed Culture, make sure to subscribe to my mailing list to get my latest blog straight from your inbox. Or, follow me on Facebook or Instagram for the latest scoop from The Mixed Culture. Feel free to email me for any questions or comment below.